Buried under a ton of paper! I joined an organizing challenge this month without realizing what I was getting myself into. But I thought, "I can do this. I NEED to organize my craft room!" So I signed up and watched the first webinar. The first one started out easy - set up four sections that will become the foundation of the organization system. They are Alphabets, Numbers and Punctuation, Themes A-Z, Calendar Year, and The Rainbow. What!? No Miscellaneous!!?? Okay. Now we are running into problems and we haven't even started yet! Then the commentator says to keep things together I would use together. Oh heck! Now I am another pickle! This means combining themes if necessary. I am only on day one and ready to throw in the towel. But I know I can do this. So on to week 2 and the second webinar - Piles of Paper. Oh, so I have piles of paper!! Since I have Close to my Heart paper, Creative Memories paper, and paper from Michaels and Costco, I decided to keep my CTMH paper separate from the rest as this is what I use for CTMH workshops and swaps. The rest of my paper is for other cards and projects that are not strictly CTMH. So I brought my containers, bags, and boxes of paper to the kitchen where I could spread it out on my huge counter top. I sorted all the paper into categories, then decided to keep it in its WOTG kits instead. Now I had to put the kits all back together, which really is a lot simpler than putting it into categories. The cardstock was arranged in color order according to the rainbow (ROYGBIV) with the whites, greys, black and browns at the ends. Then came the kits. 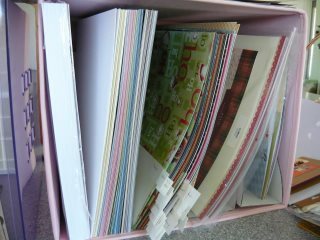 I took some old white 12"X12" cardstock and cut it in half to make dividers. I added a label folded in half to each one so I could write the name of the kit and then put them all in alphabetical order. I also added unopened WOTG kits as well as zipper bags for part pages (a corner missing or a paper that was cut in half), scraps, and zip stips off of the newer CTMH papers (and, man, do I have a lot of those!!). It looks so good!! And now it is really easy to find papers. Now I have the rest of my papers to tackle. That will be an even bigger job because they are scattered all over the place.